Enter to win Snowden on Bluray! Mind on Movies is very excited to announce that we are working with the upcoming Blu-ray release, Snowden, starring Joseph Gordon-Levitt. Academy Award®-winning director Oliver Stone (Platoon, Born on the Fourth of July) tackles the most important and fascinating true story of the 21st century. Snowden, the politically-charged, pulse-pounding thriller reveals the incredible untold personal story of Edward Snowden, the controversial figure who exposed shocking illegal surveillance activities by the NSA and became one of the most wanted men in the world. A hero to some and a traitor to others, the provocative story of what led him to that fateful decision makes for one of the most compelling and important stories in recent history. 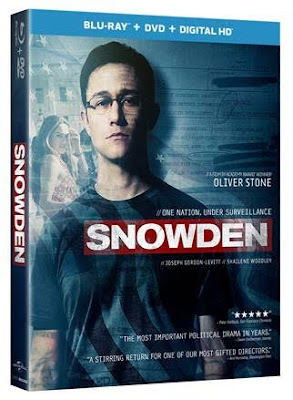 Own Snowden on Bluray and DVD on December 27th! a Rafflecopter giveaway Disclaimer: Only one entry per mailing address per giveaway. The prize will be sent via FedEx or UPS. No P.O. Boxes please. This contest is from Mind on Movies working with Universal. The entries will be checked. You must do what it says on the widget option to enter to win.